Excerpt from Guilt By Association—How Deception and Self-Deceit Took America to War (2008) State Street Publications, pp. 49-76. America is proud to be Israel’s closest ally and best friend in the world. John McCain’s father covered up the Israeli killing of 34 Americans aboard a U.S. Navy ship during the Six-Day War of 1967. As senior naval officer for Europe and the Mediterranean, Admiral John S. McCain, Jr. helped President Lyndon Johnson deceive Americans about that little known incident involving the USS Liberty. This chapter reveals that family secret. On June 8, 1967, Israeli jets attacked the USS Liberty, a 455-foot vessel, firing 30 mm aircraft cannons and rockets and dropping napalm. Three Israeli torpedo boats then attacked the ship with 20 mm cannons, 50-caliber machine guns and torpedoes. One torpedo blew a 39-foot hole in a former cargo hold of this refurbished WWII Liberty ship that had its cargo space converted to research facilities for an intelligence team. The blast killed 25 and left the ship listing nine degrees to starboard. Liberty crewmembers testified that Israeli torpedo boats fired on firefighters and stretcher-bearers. Israeli machine gunners also strafed the ship’s fire hoses and destroyed its life rafts at close range as survivors sought to douse fires and evacuate those most grievously wounded. The attackers killed 34 and wounded 174 of a crew of 294 for a 70% casualty rate. Israelis and Palestinians, Tel Aviv should talk to the Palestine Liberation Organization. Upset by that proposal, the American Israel Public Affairs Committee (AIPAC) targeted Findley for defeat in 1982. Richard Durbin, Findley’s AIPAC-recruited successor, has since been elected to the Senate where he is second ranking in the leadership. AIPAC has since evolved into a 100,000-member, $60 million per year political powerhouse now embroiled in a spy scandal involving Pentagon analyst Lawrence Franklin who provided two senior (and now former) AIPAC officials with classified U.S. military intelligence on Iran. AIPAC evolved from the American Zionist Council when, in 1959, Isaiah “Si” Kenen adopted that nondescript name for an international network of political operations organized to shape U.S. policies critical to Israel, including influencing key U.S. elections. Kenen served as executive director from 1951 to 1954, guided and funded by the Israeli government. From 1947 to 1948, Kenen had served as the Jewish Agency’s information director at the U.N. The Council was restructured as the American Zionist Committee for Public Affairs when Council leaders became uncomfortable using tax-exempt overseas funds to sway elections in the U.S. The Committee registered with the Justice Department as a foreign agent for Israel. To date, AIPAC has resisted registration as a foreign agent. In response to a question, Findley identified Arthur Krim as the Jewish adviser and fundraiser closest to Lyndon Johnson. Research quickly uncovered published materials on Krim written by the late Grace Halsell, a speechwriter for LBJ and later an author of books chronicling the political influence of Christian Zionists such as Jerry Falwell. Johnson personally hired Halsell, a native Texan, who, importantly for this analysis, was inside the White House Situation Room during the Six-Day War. With that war, Israeli security became a priority of U.S. foreign policy and a focal point of Pentagon coordination as Tel Aviv became a favored recipient of U.S. military technology. After that 1967 conflict, the U.S. also emerged as a major Israeli arms supplier. Pro-Israeli advisers surrounded Johnson in the decision-making that led to the 1967 war. “Everyone around me, without exception was pro-Israel,” Halsell recalled. She identified more than a dozen close advisers to Johnson, including Walt Rostow, his national security adviser, and brother Eugene Rostow serving as under secretary of state for political affairs, and former Supreme Court Justice Arthur Goldberg, then serving as U.S. Ambassador to the United Nations. White House counsels Leo White and Jake Jacobsen were likewise pro-Israel as were two key speechwriters: Richard Goodwin, husband of biographer Doris Kearns Goodwin, and Ben Wattenberg whose parents moved to the U.S. from Palestine. Likewise domestic affairs adviser Larry Levinson and John Roche, an avid Zionist and Johnson’s intellectual-in-residence. 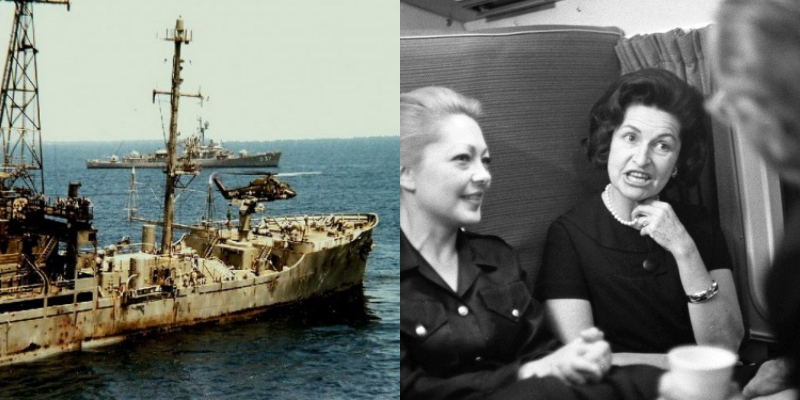 It was the role of Arthur Krim, however, that confirmed the lengthy pre-staging of the 1967 war and explained the orchestration that led to LBJ’s cover-up of the Israeli attack on the USS Liberty. A New York attorney and president of United Artists, Krim also served as finance committee chairman for the Democratic Party when Johnson was its leader and Jewish contributors accounted for more than half the funds raised. A series of Jewish males chaired the finance committee for the Democratic Party at critical junctures. Those men include August Belmont, a Rothschild financial agent after whom the New York horseracing track is named. Belmont’s financial backing matured into his chairmanship of the National Democratic Committee, 1860-1872. Henry Morgenthau, a naturalized German Jew, chaired the finance committee of the Democratic National Committee during Woodrow Wilson’s successful presidential campaigns of 1912 and 1916. In 1913, the same year Wilson appointed him U.S. Ambassador to the Ottoman Empire, Henry Morgenthau, Jr. acquired a farm near Franklin D. Roosevelt’s Hyde Park estate. In 1914, Morgenthau Senior arranged for Jacob Schiff of Kuhn, Loeb & Company to raise $50,000 to rescue Jewish settlements in Palestine. Absent this Morgenthau/Schiff alliance: “Palestinian Jewry almost certainly would have perished.” Morgenthau Senior led one of several elite Jewish delegations to the 1919 Paris Peace Conference where Wilson’s 14 Points were scuttled, including Arab self-determination. In its place, a “mandate” system forced long-warring tribes of Sunnis, Shias and Kurds into a single state (Iraq). As part of the Treaty of Versailles ending World War I, an onerous reparations burden was imposed on Germany. That debt-imposed humiliation provoked an extreme form of German nationalism and a recession-fueled fascism that led to World War II and Germany’s embrace of the National Socialist Party. Under Adolph Hitler, the Nazi government portrayed all Jews as complicit in the un-payable debts imposed at Versailles. As President Roosevelt’s Secretary of the Treasury during WWII, Henry Morgenthau, Jr. advised that FDR limit Jewish immigration to the U.S.
Mathilde Krim, a striking blonde Italian 20 years younger than her husband, was previously married to Davin Danon. Raised in Palestine, her handsome Jewish-Bulgarian husband was exiled by the British for his activities with Irgun Zvai Leumi, the Zionist-terrorist network led by Menachem Begin who emerged as Likud Party Prime Minister in 1977. Mathilde also worked as an Irgun operative, largely in Europe. As with Morgenthau’s proximity to Roosevelt, the Krims’ proximity to Johnson ensured that their friendship flourished when the Senate majority leader became John F. Kennedy’s surprise pick as Vice President and then succeeded him to the Presidency following Kennedy’s assassination in November 1963. 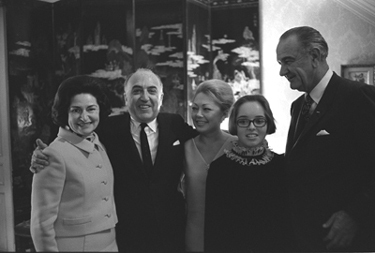 Over the 1967 Memorial Day weekend, the Krims were houseguests at the LBJ Ranch when the commander-in-chief learned of Soviet Premier Aleksei Kosygin’s warning that “if Israel starts military action, the Soviet Union will extend help to the attacked party.” While waiting for the State Department to draft a response to Israeli Prime Minister Levi Eshkol, Johnson and the Krims drove to a neighbor’s home where an aide brought the message for the president’s review. According to Kennedy Under Secretary of State George Ball, Johnson made it clear both to the Israelis and his Jewish-American supporters that the U.S. would not object if the Israelis took matters into their own hands. Defense Secretary Robert McNamara offers a different account, recalling that Johnson and he “put immense pressure on [Israeli foreign minister Abba Eban] to persuade his government not to pre-empt.” Johnson’s Kosygin-prompted note to Levi Eskhol, written in the presence of Arthur and Mathilde Krim, suggests that both men are correct: Tel Aviv could preempt provided the American public could be induced to believe that Israel was the victim and not the aggressor, a strategy fully consistent with game theory. The next day, Johnson visited the home of political adviser Abe Fortas for a dinner with Defense Secretary Robert McNamara and New York investment banker John Loeb. Fortas had cemented his confidante relationship with Johnson in 1948 when, in LBJ’s first Senate race, the Washington lawyer finessed the extensive vote fraud apparent in the Democratic primary, in which Johnson claimed an 87-vote victory, including 200 votes tallied in alphabetical order. Fortas’ legal strategy ensured that Johnson’s name appeared on the November 1948 Federal ballot as the Democratic Party candidate. In what was then a strongly Democratic state, that Fortas-enabled result assured the ambitious Texan a seat in the U.S. Senate. In October 1965, as president, “Landslide Lyndon” appointed Fortas to replace Arthur Goldberg on the Supreme Court after persuading Goldberg to serve as U.N. Ambassador. Fortas became embroiled in scandal when it was discovered that stock swindler Louis Wolfson offered to pay Fortas and his wife $20,000 per year to make up for his lost income as a lawyer. Justice Fortas accepted the first installment in January 1966. The payment was revealed in 1968 as part of a successful Senate filibuster by Republicans and “Dixiecrats” (conservative southern Democrats) when Fortas was denied his Johnson appointment as Chief Justice to succeed Californian Earl Warren. In a scenario reminiscent of Eddie Jacobson tearfully lobbying his friend Harry Truman to recognize the Jewish state in 1948 (chronicled later in the Criminal State series), Lyndon Johnson was lobbied in 1967 by Arthur Goldberg to protect the Jewish state in the lead-up to the Six-Day War. When Goldberg deployed heart-rending rhetoric to portray Israeli vulnerability and the pending victimization of Jews at the hostile hands of an Arab “ring of steel,” Johnson waved a Central Intelligence Agency report predicting Israel could win any war in the region in two weeks. When Goldberg persisted, Johnson ordered the CIA to revisit their analysis. The agency returned with a revised report concluding that Israel could win any war in the region in one week. On June 4, as the Fortas dinner party was winding down, Fortas cautioned Johnson that war might soon erupt in the Middle East. When LBJ turned to Defense Secretary McNamara for his opinion, the Pentagon chief said there would be no war. Johnson confirmed that U.S. intelligence agencies agreed with McNamara’s assessment. Johnson left for the White House at 10:58 p.m.
At 4:30 a.m. on June 5, Walt Rostow called LBJ to inform him that Israel had attacked Egypt. Mathilde Krim, the former Irgun operative, was Johnson’s guest at the White House that night. Before informing anyone else, LBJ stopped by the blonde beauty’s bedroom to tell her, “The war has started.” Not until more than three hours later, at 7:45 a.m., did Johnson speak with Soviet Premier Kosygin who expressed his hope and expectation that the U.S., as Israel’s closest ally, would restrain Tel Aviv. In the war’s first few hours, the “victimized” Israelis destroyed the Egyptian Air Force while its aircraft were still on the ground. By evening, the Jordanian Air Force was also largely destroyed. Walt Rostow sent Johnson a memo describing Tel Aviv’s military success as “the first day’s turkey shoot.” LBJ also received a memo that day from Arthur Krim that read, “Many arms shipments are packed and ready to go to Israel, but are being held up. It would be helpful if these could be released.” Johnson ordered the arms shipped. By the evening of the second day, two-thirds of Syria’s air force had been destroyed. According to Halsell, the glee in the State Department Operations Room was palpable, leading Eugene Rostow to caution, “Gentlemen, gentlemen, do not forget that we are neutral in word, thought and deed.” At the State Department’s mid-day press briefing, spokesman Robert McCloskey repeated Rostow’s official “neutrality” lie. Israel was neither under attack nor under threat of attack as Israeli commanders later conceded. The air raid sirens were props in the stagecraft of waging war by way of deception. The circumstances were stage-managed to make both Israelis and foreign observers believe the Jewish state was endangered while Tel Aviv annexed land belonging to its neighbors that it still occupies four decades later. In the lead-up to the Six-Day War, Fortas emerged as a back channel between the Israeli embassy and the White House. He had known Israeli Ambassador Avraham Harman since the ambassador’s arrival in Washington in 1959. During Prime Minister David Ben-Gurion’s visit to the U.S. in March 1960, Fortas sponsored a breakfast at his home attended by Harman and Johnson who was then Senate Majority Leader. Throughout the six days of war, Near East experts met daily with Johnson in the Cabinet Room. Justice Fortas attended each meeting. Reflecting on comments by Fortas to Johnson at their June 4 dinner party, John Loeb wrote to Fortas on June 6: “You were prophetic about the Middle East. Thank the Lord the President has you as a friend and counselor.” In the summer of 1970, The New York Times reported that Fortas had registered as a lobbyist for Kuhn, Loeb & Company. In 1873, Jacob Schiff joined Kuhn, Loeb & Company in Manhattan and, two years later, married Therese Loeb, Solomon Loeb’s daughter. According to Chernow, “Schiff came from a family that had befriended the Rothschilds and that counted six centuries of scholars, rabbis and businessmen.” Paul Warburg married Nina Loeb, daughter of Solomon Loeb of Kuhn, Loeb & Co., then chief financial agent of the Rothschilds in the U.S. Felix Warburg, who moved to the U.S. in 1895, married Frieda Schiff, daughter of Jacob Schiff, then best known for managing bond issues to finance railroads, including a reorganization of the Union Pacific Railroad in 1897. If the Israelis go fast enough and the Soviets get worried enough, a simple cease-fire might be the best answer. This would mean that we could use the de facto situation on the ground to try to negotiate not a return to armistice lines but a definitive peace in the Middle East. In other words, peace was possible provided everyone agreed that Tel Aviv could retain land seized with a preemptive attack that was still ongoing. In a memo, Ben Wattenberg and Larry Levinson cautioned Johnson that the U.N. may attempt “to sell Israel down the river.” By then, pro-Israeli supporters had gathered in Lafayette Square across from the White House demanding a statement of presidential support for Israel and insisting on a repudiation of the official White House stance of avowed neutrality. Though Johnson retired for the night at 11:30 p.m., White House records show he received a call at 11:59 p.m. from Mathilde Krim who had traveled to New York earlier in the day though only after leaving LBJ a personal note supportive of Israel and urging that he deliver her message “verbatim to the American people.” Johnson declined to relay her message in a presidential address. He did, however, recommend her comments to Secretary of State Rusk. On the night of June 7, the naval intelligence ship USS Liberty approached within sight of the Gaza Strip. Cruising in international waters more than 12 miles off the coast of the Sinai Peninsula, the vessel monitored communications in that sensitive area, particularly activity by aircrews assigned to Soviet bombers in Egypt. As Egypt was a Soviet client state, any Egyptian attack on America’s ally Israel could drag the U.S. into a nuclear war. The U.S. had a need to know. Under the command of General Moshe Dayan, Israel was preparing for an attack the next day that would complete this stage in Israel’s territorial expansion for Greater Israel by capturing Syria’s Golan Heights. Those seeking a reason for Israel’s attack on the USS Liberty suggest it was to prevent Washington from learning that the Israeli offensive was continuing despite calls for a ceasefire by the Syrians, the Soviets and the U.S. When news of the Israeli attack on Americans reached the U.S., the Israel lobby shifted into high gear along with its Congressional contingent and its media counterpart. Wattenberg assured Johnson that if he supported Tel Aviv’s account of the USS Liberty incident as a case of “mistaken identity” and ignored the 208 American casualties, including 34 killed, influential Jews in the U.S. media would tone down their criticism of his policies in Vietnam. In return for his defense of Israel and a presidential cover-up, the shift in mainstream media opinion provided a temporary political respite for the war-weary president who, less than a year later, declined to run for reelection. By then Clark Clifford had replaced Robert McNamara, who had grown sour on the war, as Secretary of Defense. On March 22, 1968, Johnson convened a meeting of his senior informal advisory group on Vietnam. To his surprise, only Abe Fortas and General Maxwell Taylor, chairman of the Joint Chiefs of Staff, continued to support a hard-line approach. The rest were either lukewarm or opposed to the war. In his memoirs, Clifford recalls how, nine days later, after LBJ announced he would not stand for reelection, the president “wandered around the White House talking to people and viewing, with evident pleasure, the bewildered analysis of the commentators on television” who failed to anticipate his decision. 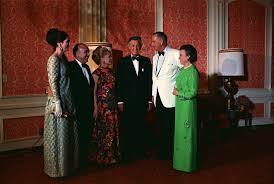 Then Clifford and Johnson returned to the West Hall of the White House where they joined a few others with whom the commander-in-chief enjoyed a special relationship, including the Rostows and Arthur and Mathilde Krim. As the USS Liberty came under attack, Navy fighter jets were launched from nearby aircraft carriers USS Saratoga and USS America. Defense Secretary McNamara had them recalled on Johnson’s direct order. Never before in U.S. military history had a rescue mission been cancelled with a U.S. Navy ship under attack. Richard Parker, former U.S. political counselor of the U.S. Embassy in Cairo in 1967, recalls an initial assumption that the attackers were Egyptian and that the jets were recalled when it was learned that Israel was the attacker. Nor did the court consider written testimony from any of the 60 medical evacuees who were unable to testify in person, including James Ennes who was officer of the deck when the attack began. Even before the court convened, Admiral McCain framed the findings to support Tel Aviv’s claim that, in the fog of war, its forces mistook a sophisticated U.S. Navy intelligence vessel for a dilapidated Egyptian freighter. Tel Aviv claimed that a clearly marked U.S. Navy ship bristling with 40 special purpose antennae had been mistaken for El Quseir, an Egyptian horse cavalry transport roughly half its size that was then berthed in Cairo waiting to be scrapped. The torpedo depth set by Israeli torpedo boats was perfect for tearing a hole in the USS Liberty. A torpedo set for that depth would have run under the Egyptian ship, due to its shallow draft. Admiral McCain’s order provided Johnson the “fixed” record required to conceal an Israeli attack on a U.S. Navy vessel that, the evidence suggests, was meant to kill all 294 Americans aboard. Conversations recorded between the pilots and Israeli ground control confirm they not only knew the ship was American but were also frustrated at the difficulty in sinking it quickly and completely with no survivors. John McCain’s grandfather was known as Slew by his fellow officers and, affectionately, as Popeye by the sailors who served in his command. A native of Mississippi whose grandfather owned slaves, he played the horses, sipped bourbon and water and rolled his cigarettes with one hand. Admiral McCain was commander of all land-based aircraft in the South Pacific during WWII. A 1906 graduate of the Naval Academy, the aircraft carriers under his command once shot down 49 Japanese planes in a single day and destroyed 3,000 grounded enemy planes in a 35-day period. Planes under his command took part in action over Leyte Gulf, Luzon, Formosa and the Japanese Homeland. Admiral McCain died September 2, 1945, less than three weeks after the victory over Japan (VJ Day) on August 14, 1945. John McCain’s father, a 1931 graduate of the Naval Academy, served as a submarine commander during WWII. He too became a navy aviator and also rose to the rank of four-star admiral, the first family in U.S. military history to achieve that father-son distinction. In July 1968, one year after aiding Johnson with the cover-up, he was named Commander-in-Chief of the Pacific Command (CINCPAC) during the Vietnam War, a position he held until 1972. Admiral McCain died March 24, 1981. Lieutenant Commander John S. McCain III, a 1958 graduate of Annapolis (894th in an academic class of 899), served as a navy pilot assigned to the aircraft carrier USS Oriskany when his A4E Skyhawk aircraft was shot down by a surface-to-air missile over Hanoi. He retired a captain after serving from 1958-1981. He was elected to the Congress in 1982 and to the Senate in 1986 to a seat vacated by Barry Goldwater. Two civilian lawyers scrubbed the official report on the USS Liberty, diverting attention away from Tel Aviv. After the report was redrafted (by the people in between), the official record left no reference to the Israeli machine-gunning of life rafts, a clear war crime. In effect, the McCain cover-up granted plausibility to an implausible claim: Israel Defense Forces mistakenly attacked a U.S. Navy ship with an estimated 30 sorties flown over the 455-foot vessel by a minimum of 12 aircraft, leaving 821 holes, more than 100 of which were rocket-size, while also jamming all five of its emergency radio channels. Despite an interim CIA report favoring Israel’s account, Helms noted, “there could be no doubt that the Israelis knew exactly what they were doing in attacking the Liberty.” “It was no accident,” Helms reported. Admiral Thomas Moorer, former Chairman of the Joint Chiefs of Staff (1970-74), called it “one of the classic all-American cover-ups.” Helms recalled: “It was the world’s good fortune that the hostilities on the Golan Heights ended before that day was out.” Early on June 10th, Soviet Premier Kosygin utilized the hot line between Moscow and Washington to warn of a “grave catastrophe” and promised “necessary actions, including military” should Israel fail to halt operations within the next few hours. Even now, few Americans realize that Israel’s 1967 war of expansion in the Middle East resulted in the two nuclear-armed superpowers squaring off just five years after the Cuban missile crisis. In the midst of this conflict, Moscow threatened an “independent decision” if the U.S. failed to bring Israeli aggression to a speedy close. After years of research for this book, Judge A. Jay Cristol has reached a similar conclusion to one my father reached in his June 18, 1967 endorsement of the findings of the court of inquiry. I commend Judge Cristol for his thoroughness and fairness, and I commend this work. After eight hours of surveillance, Israel launched a two-hour air and naval attack against the USS Liberty. Israel attempted to prevent the Liberty’s radio operators from sending a call for help by jamming American emergency radio channels. Israeli torpedo boats machine-gunned at close range lifeboats that had been lowered to rescue the most seriously wounded. There is compelling evidence that Israel’s attack was a deliberate attempt to destroy an American ship and kill her entire crew. That due to the influence of Israel’s powerful supporters in the United States, the White House deliberately covered up the facts of this attack from the American people. That a danger to our national security exists whenever our elected officials are willing to subordinate American interests to those of any foreign nation. The truth continues to be concealed to the present day in what can only be termed a national disgrace. In addition to calling for a new court of inquiry and a congressional investigation, the commission urged that June 8 be proclaimed USS Liberty Remembrance Day in order to remind the American people of the threat to U.S. national security inherent in any passionate attachment of elected officials to a foreign nation. Much as Admiral John S. McCain, Jr. saw his career advance when, after the cover-up, he was named Commander of the Pacific Fleet, Admiral Kidd advanced from Rear Admiral (two stars) to a four-star admiral and Commander of the Atlantic Fleet. Bill McGonagle, the ship’s skipper, received a promotion, command of a newly commissioned ship and the Congressional Medal of Honor. In a break with military tradition, the nation’s highest honor for valor was presented not at the White House but at the Washington Navy Yard. This is obsequious, unctuous subservience to the peripheral interests of a foreign nation at the cost of the lives and morale of our own service members and their families. It should no longer be condoned. No protest was heard from the Congress for which the medal is named. Before the award was bestowed, the White House consulted the Israelis who gave their permission to proceed. McGonagle’s daughter later conceded to a fellow veteran that her father admitted he was pressured to fabricate a pro-Israeli account of the assault. As court counsel Ward Boston summarized Admiral Kidd’s assessment: “we’ve been ordered to shut up.” Not until 1982 were gravestone inscriptions changed to name the USS Liberty as the ship on which Americans died in what the Liberty’s crew thought was a defense of American interests. For 15 years, the inscriptions read simply, “Died in Eastern Mediterranean.” The ship’s name was added only after a protest from the USS Liberty Veterans Association. From a game theory perspective, the cover-up enabled by Admiral McCain was essential to preserve Israel’s portrayal of itself as a hapless victim residing in an anti-Semitic region. That lie also helped cover up the fact that the 1967 War was not defensive but a pre-planned land grab for Greater Israel. By taking territory while feigning self-defense, that conflict also served as a provocation certain to catalyze a response that could plausibly enable the next war (in 1973) to be portrayed as “defensive” when Israel’s neighbors sought to reclaim the land taken. Yitzhak Rabin, Israel Defense Forces chief of staff in 1967 would later concede: “I do not believe that Nasser wanted war. The two divisions he sent into Sinai on May 14 would not have been enough to unleash an offensive against Israel. He knew it and we knew it.” Similarly, General Moshe Dayan explained that, “many of the fire-fights with the Syrians were deliberately provoked by Israel.” He explained that the kibbutz residents who pressed the government to take the Golan Heights did so less for the security than for the farmland. In December 1987 the USS Liberty incident was officially closed with an exchange of diplomatic letters and Israel’s payment of $13.7 million in reparations, including $6 million for a ship then valued at more than $40 million. The USS Liberty was dismantled and sold as scrap in 1973 for $110,000. On June 8, 2005, the USS Liberty Veterans Association filed a war crimes report with Secretary of Defense Donald Rumsfeld. By law, the secretary is obliged to initiate an inquiry on receipt of such a serious charge. As of September 2008, the report had been forwarded to five separate bureaucracies that declined the challenge the adequacy and integrity of the McCain court of inquiry. The Israeli killing of Americans aboard the USS Liberty (a premeditated murder according to Admiral Moorer) marked a strategic milestone for the Jewish state. No one in the Israeli government or military received even a reprimand. Tel Aviv suffered no political repercussions either for its preemptive seizure and continued occupation of Arab lands or for the murder of Americans. Instead, Lyndon Johnson increased U.S. financial, military and political support and the Pentagon was directed to include security of the belligerent Zionist state as a strategic objective of U.S. national security. By advancing the careers of senior Naval officers complicit in the cover-up up, Johnson signaled future generations of military leaders that they can expect promotions if, following orders, they abandon their tradition of duty and honor. Much as AIPAC intimidated Members of Congress by removing from office Paul Findley and others who challenged Israeli policies, LBJ set a precedent for rewarding military commanders who subordinate their honor to Israeli interests. As a senior member of the Senate Armed Services Committee, John McCain heard the February 2003 testimony of Army Chief of Staff General Eric Shinseki when he warned that “several hundred thousand” troops would be required to invade and secure Iraq. Deputy Defense Secretary Paul Wolfowitz assured the committee that 50,000 troops would be sufficient. McCain did not object when General Shinseki was rebuked by war-planner Wolfowitz. Instead, he told the Hartford Courant in a March 5, 2003 article, just before the invasion: “I have no qualms about our strategic plans.” Later he claimed credit for advocating a “surge” in U.S. troops to quell a deadly sectarian insurgency that could have been prevented by heeding Shinseki’s call for more troops. Candidate McCain cites that surge as a key qualification to serve as commander-in-chief. It is difficult to imagine a presidential candidate less qualified to restore the honor of the U.S. Navy in light of the McCain-enabled cover-up of the USS Liberty incident. Soon after the Six-Day War, France canceled an Israeli contract for the delivery of 50 Mirage jet fighters. That led to U.S. negotiations for the delivery to Israel of 50 Phantom F-4 jet fighters beginning in 1969. Within two years of the Six-Day War, the Pentagon was training Israeli pilots on U.S.-made fighter jets. With that step, any future Israeli aggression in the region would be perceived as enjoying the approval of U.S. foreign policy and the enthusiastic support of Americans. Israel soon emerged as a major arms supplier worldwide as a sizeable portion of its workforce became dependent on the perception of Israel as a weak and vulnerable state under siege by a hostile world of anti-Semites, Jew haters and Holocaust deniers. Yet it was only after Israel’s 1967 land grab that such charges were deployed in the U.S. to intimidate and discredit Americans who criticize Israeli policies. Israel suffered no consequences for killing 34 Americans. Instead, Tel Aviv again proved its prowess at waging war by way of deception based on its mastery at manipulating a U.S. President by servicing not only his personal and emotional needs (Mathilde Krim) but also his political and financial needs (Abe Fortas, Abe Feinberg, Arthur Krim, Arthur Goldberg, et.al.). In addition, Israel again confirmed the success of a long-term strategy for Greater Israel that pre-stages supportive personnel (agents, assets and sayanim) for key political positions inside the U.S. government: the Rostow brothers, Fortas, Goldberg, Jacobsen, Goodwin, Levinson, Wattenberg, etc. When Johnson declined to make delivery of nuclear-capable F-4 Phantom jets contingent on Israeli compliance with the Nuclear Non-Proliferation Treaty, he not only signaled that the U.S. had no objection to Tel Aviv’s nuclear weapons program, he also opened the way for Israeli firms to distribute nuclear components worldwide and signaled the U.S. was not serious about non-proliferation. When Johnson chose not to pursue John Kennedy’s efforts to shut down the Zionist state’s nuclear weapons program, he enabled Israel to use the fear of nuclear weapons as a means to provoke, without fear of retribution, the regional frictions that made plausible The Clash of Civilizations. That conflict-of-opposites emerged seamlessly as a successor to the nuclear terrorism of Mutual Assured Destruction (MAD) that dominated an earlier conflict-of-opposites: the Cold War era. The 1967 war pre-staged the regional dynamics that made plausible the latest present danger: the global war on terrorism. By providing Tel Aviv with an arsenal of modern offensive weapons along with an agreement limiting their use for defensive purposes, Johnson further emboldened Israeli game theorists. With access to America’s state-of-the-art weaponry, Israel became better equipped to provoke reactions to which Israel Defense Forces could respond in “self-defense.” In effect, LBJ gave game theorists the military means and motive to wage agent provocateur warfare against which Tel Aviv could then defend, justifying Israeli requests for more U.S. military assistance. The history of weaponry confirms that each advance in defensive weaponry catalyzes an advance in offensive weaponry (and vice versa). In the midst of the SALT talks (Strategic Arms Limitation Treaty) in Reykjavik, Iceland in 1986, Ronald Reagan and Soviet Leader Mikhail Gorbachev were on the verge of overruling their advisers and reaching an agreement to eliminate all strategic nuclear weapons. At the time, Reagan sought to pursue development of a missile defense program. Gorbachev proposed that the U.S. program be limited to laboratory work for 10 years for fear that Reagan’s Strategic Defense Initiative (SDI) might catalyze an arms race in space while jeopardizing steps to eliminate vast arsenals of land- and sea-based nuclear weaponry. Had Reagan agreed to that one-decade limitation two decades ago, nuclear weapons might now be eliminated in their entirety, removing the threat of that weapon of mass destruction. Richard Perle, an exemplar of the people in between, boasted how he undermined that potential Reagan-Gorbachev agreement when he persuaded Reagan that, by accepting Gorbachev’s proposal, the SDI program would be endangered. Had an agreement been reached in 1986 to eliminate all nuclear weapons, Israel’s “opaque” nuclear weapons program would have been affected as well, negating a key game theory advantage that Tel Aviv has since deployed with success. In the oft-recurring conflict-of-opposites manipulation chronicled in this account, each new offensive weapon evokes a new defensive weapon, just as each new defense catalyzes a new offense. Thus the focus in this account on identifying those who catalyze serial conflicts-of-opposites while profiting off the misery of both sides. From a game theory perspective, by covering up the murder of Americans aboard the USS Liberty, a U.S. President (with the aid of Admiral John McCain, Jr.) confirmed that Israeli extremists could kill Americans without endangering U.S. support. The encouragement of Israeli extremism was further enhanced by the discouragement Americans experienced during the 1960s. The debacle in Vietnam and a decade of high-profile murders (the Kennedy brothers and Martin Luther King, Jr.) laid the mental and emotional threads for Americans to believe four decades later that it was their elected government (vs. an unelected government inside their government) that was responsible for the debacle in Iraq. I was never satisfied with the Israeli explanation. Their sustained attack to disable and sink Liberty precluded an assault by accident or by some trigger-happy local commander. Through diplomatic channels we refused to accept their explanation. I didn’t believe them then, and I don’t believe them to this day. The attack was outrageous. What followed was just as bad. For 20 years, since the creation of Israel, the United States had tried to persuade the Arabs that they needn’t fear Israeli territorial expansion. Throughout the 1960s the Arabs talked continuously about their fear of Israeli expansion. With the full knowledge of successive governments in Israel, we did our utmost to persuade the Arabs that their anxieties were illusory. And then following the Six-Day War, Israel decided to keep the Golan Heights, the West Bank, the Gaza Strip, and the Sinai, despite the fact that Israeli Prime Minister Levi Eshkol on the first day of the war went on Israeli radio and said that Israel had no territorial ambitions. Later in the summer I reminded Abba Eban [Israel’s Foreign Minister] of this, and he simply shrugged his shoulders and said, “We’ve changed our minds.” With that remark, a contentious and even bitter point with the Americans, he turned the United States into a 20-year liar. The Six-Day War pre-staged today’s geopolitics. Following that 1967 conflict, America discredited itself by allowing its values to be associated with Israeli duplicity. By its entangling alliance with a duplicitous state, the U.S. was seen as a partner in the same treachery and deceit for which Israel was already infamous. Israeli offenses against international law were routinely covered up by U.S. vetoes of U.N. Security Council resolutions. In the U.N. General Assembly, American diplomats routinely defended Israeli violations of norms of civilized behavior. As American values of moderation, tolerance and candor became identified with Israeli extremism, racism and deceit, the U.S. emerged guilty by association. Meanwhile U.S. policymakers continued to deceive themselves that Israel was a democracy and an ally. The region-wide resentments provoked by Israel’s 1967 aggression ensured an enduring anger that Tel Aviv periodically rekindled, reinforced and refocused as part of a long-term emotion-management modus operandi. Post-9/11, regional animosities were again inflamed by reports confirming what those in the region had already surmised: The intelligence that induced Israel’s ally to invade Iraq was false, flawed and “fixed” around an agenda advanced by those notorious for their mastery of strategic deceit. Such strategic duplicity may come as a surprise to misinformed Americans. It comes as no surprise, however, to those who have long lived in close proximity to a state known for routinely waging war by way of deception. Even now, Americans believe that Israel was the victim in the 1967 conflict and not the aggressor, confirming the key role of self-deceit in sustaining this entangling alliance. Israeli Air Force commander Motti Hod boasted that Tel Aviv’s destruction of the Egyptian Air Force had been planned and rehearsed since 1951, five years before Israel invaded Egypt to catalyze the Suez Crisis (one week before the 1956 U.S. presidential election) and 16 years before the Jewish state launched its preemptive war of 1967. That war, in turn, fed regional dynamics that would make plausible The Clash of Civilizations as the latest present danger, catalyzed by the emotionally wrenching provocation of September 11, 2001. Lengthy pre-planning ensured that, on a bright June day in 1967, it took only 80 minutes for Israeli jets to destroy 309 of Egypt’s 390 aircraft and kill a third of its pilots. The assault was planned for 7:45 a.m. Tel Aviv time because Israeli intelligence knew Egyptian pilots would be relaxing from early morning patrols and Egyptian commanders would be caught in rush hour traffic enroute to their offices. According to George Ball, President Kennedy’s Acting Secretary of State, the fiction that a defenseless Israel was playing David to an Arab Goliath was “mythmaking for the ill-informed American public” dispensed by a pro-Israeli media. The saga of the oft-threatened underdog fighting for its survival required, then as now, a combination of national scale psy-ops and geopolitical pre-staging. Had an unbiased media inquired how, if Arabs were the aggressor, they were surprised with their air forces on the ground, Israel’s victim status would have proven a far more difficult sell. Then, as now, a complicit media was essential to sustain the myth. Tel Aviv continues to stage serial provocations as part of a psy-ops strategy designed to portray Israeli extremists as sympathetic victims. Even now, American lawmakers continue to believe the U.S. enjoys a “special relationship” of trust with a faithful ally. Yet the facts suggest that alleged friend drew on America’s post-WWII stature to vouch for an extremist enclave’s status as a legitimate sovereign state. Then as now, America’s leadership was susceptible to deception and self-deceit. Israeli mythmaking was granted additional credence when, in August 2000, the Clinton-Gore Administration awarded a former Irgun operative the nation’s highest civilian honor. 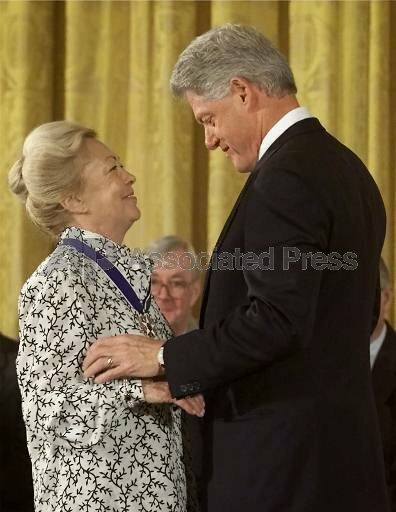 For her public service on AIDS-related research and policies, the Presidential Medal of Freedom was bestowed on Mathilde Krim in August 2000 for her “extraordinary compassion and commitment.” No mention was made of her well-timed special relationship with an earlier commander-in-chief. President Clinton awards the Presidential Medal of Freedom to Mathilde Krim, Ph.D., during ceremonies in the East Room of the White House, Wednesday, Aug. 9, 2000. (AP Photo/Pablo Martinez Monsivais).